Tipping Competition Rules | How Does One Pick Tipping Work? Simple rules and challenging competition – our mobile app provides a new twist on regular footy tipping comps. The One Pick Tipping competition is run and operated from the mobile app available via the App Store or Android Play. It’s FREE to Download & Play – why not to give it a go! 1. Each player picks a winner from one game of each NRL round – Pick from any game you like! 2. If your team wins, you will get a points multiplier score equal to the odds published by the One Pick Tipping team. Example: If you selected Parramatta (whose odds were $2.50) to beat Melbourne and they win then you will receive a points multiplier score of 2.50. 3. At the end of the round, your current points are multiplied by your winning points multiplier score. If your chosen team did not win, you do not lose points. 4. Whoever has the highest point tally after the end of the tipping competition‘s regular season (finals not included) will be declared the One Pick Tipping tipping champion. At the start of the season you will start with 1 point, this will be multiplied by each of your winning tips as you progress through the NRL season. Check out the example below that shows a player progressing through four rounds with one loss. Ready to get started? 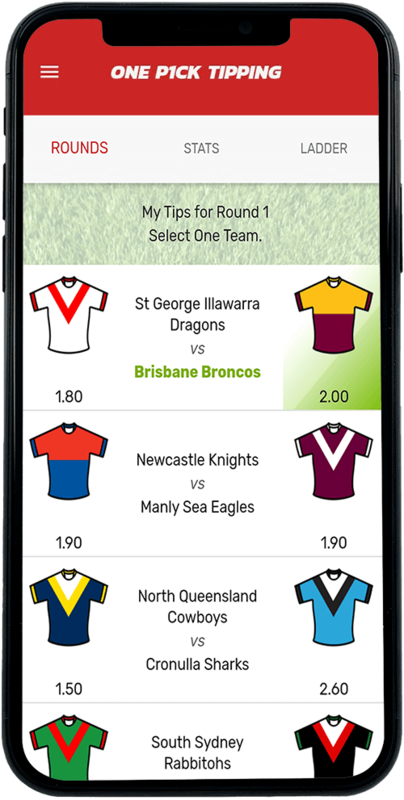 Download the app on apple or android and starting creating free NRL tipping comps with your mates today.